Are you tired of worrying about your PS4 overheating from extended game play? Doesn't it stink when you have to turn your console off in the middle of a game so it can cool down? Well, folks, we've created a solution for you that is taking game playing by storm. Say hello to the Dual-Fan PS4 cooling dock! Now, you can play games for hours without compromising your console! **Multi-Purpose *:***The charging dock is compatible with the PS4, PS4 Slim and PS4 Pro console. Conveniently, it can also keep your PS4 cooling while it is charging. 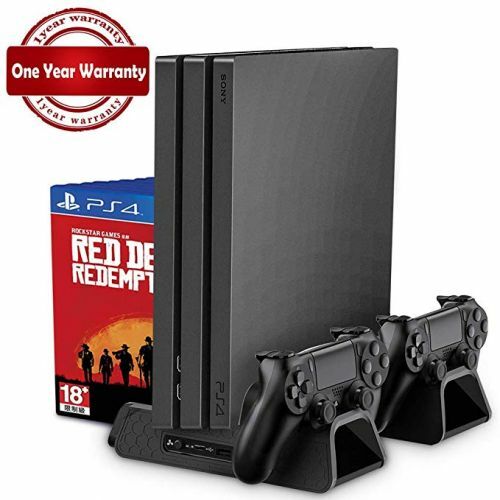 Extremely Efficient Cooling System:** The dock is equipped with 3 high-speed built-in cooling fans that keep your PS4 cool, evenly disperse heat away from the console, and enhance the longevity of your PS4. You never have to worry about your PS4 burning your table to to extended game play. Slim Design:** The dock is designed to be vertical so it saves you a lot of space. It can also store up to 12 of your favorite PS4 games. Convenient:** The power supply comes from the PS4 USB ports. You don't need any extra adapters. It has the ability to simultaneously charge 2 PS4 controllers. Awesome! High-Quality Design:** The PS4 dock is designed with anti-slip EVA material on both of its sides to deter scratching and slippage of your console. As you can see, our amazing PS4 cooling dock console bears an all-in-one design. It is designed to stand vertically to save you space as well as charge your controllers at the same time! Our cooling dock encourages the longevity of your PS4 console by keeping it cool at all times. You can game with friends for as long as you like without a problem. The design of out dock is very easy to operate. Simply push a button to turn it on and off. The base will still remain powered in order to charge your controllers. All you do is plug and play. very simply setup! The high output of power in the charging station allows you to charge two controllers at the same time. The dock is equipped with 2 LED charging indicator lights to show you the charging status.